Custom Home in a suburb west of Boston. 3,480 sq. ft. in two stories + a walk-up attic. If you stay in one place long enough and provide good service, clients come back. A summer retreat for a family you designed a primary home for, a second and sometimes third addition for a family whose size or needs expand. A commercial space for a previous residential client or vice versa. Recently Incite has seen a new phenomenon; downsizing from a family home in suburbia to an urban pad. Currently Incite is designing the renovation and remodeling for an in-town home for a family that we designed a suburban home for west of Boston. The original home was never featured on our website. Working again with this client prompted us to photograph it, 15 years after it was built, and we feature it here. The current project appears as Sideways Downsize. Construction on the Applecrest site is progressing, with this unusually mild New England winter aiding in the effort. Incite’s excitement to design a new home is rewarded when the design comes to life and this home is no exception. Bringing a new house through the planning and design phase, from sketch to a thoughtful, well designed home, alongside the client and the builder, is the opportunity that all designers crave. 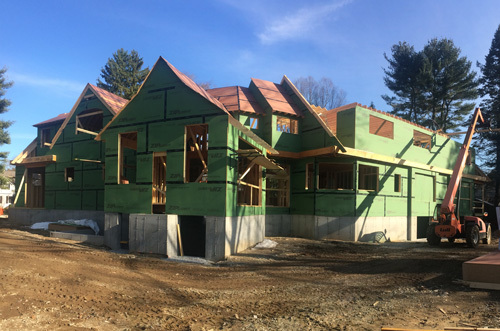 Walls and roofs are coming together at Applecrest, and the form of the home is now seen from both the street façade and the rear yard. 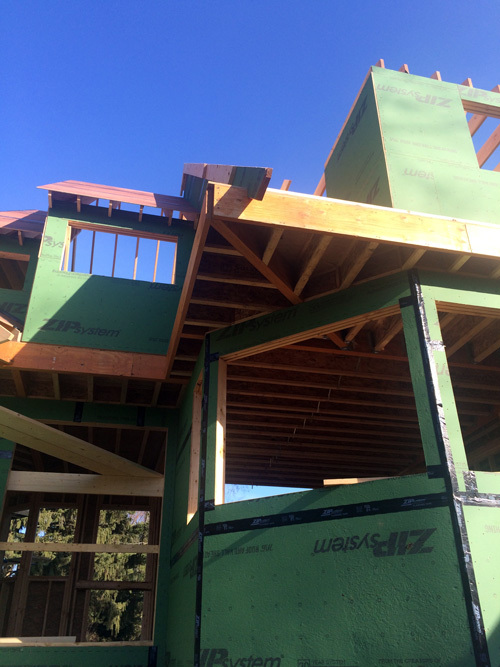 With an almost complete first floor shell, the framers have moved to the second floor and roof framing. Visits to the site provide opportunities to capture progress photos like these. Stay tuned for more construction updates.